A little while ago I visited Causeway Coast Aesthetics in my hometown of Portstewart to try the Caci Non-Surgical Facelift. I realise I am ‘young’, but ever still approaching 30. A philosophy of ‘prevention over cure’ wins every time for me in all aspects of life, and especially skincare. I am already doing everything I can to keep my skin as youthful as possible in the long term and I will share my routines and supplements with you in another post! Rhonda who owns the clinic has very recently made the North Coast her home, and she is every bit as warm and inviting as her Scottish accent! After falling in love with Portstewart Strand, and the therapeutic effects of the waves and the ocean being on your doorstep, she made the leap across the water. Having owned and managed multiple salons in Scotland in previous years, Rhonda has chosen Portstewart to launch her business of Non-surgical treatments, in particular the incredible CACI Non-surgical Facelift. This celeb favourite treatment (apparently J-Lo has her own machine at home) is something that has been lacking outside of Belfast and I’m delighted the women (and men!) of the North Coast can now avail of this results driven and science based treatment. First Rhonda gives you a complete consultation asking skin and health questions covering any current medication etc. It’s important to be honest here (don’t be shy!) as she explained to me how medicines like common anti-depressants can cause the facial muscles to relax, therefore defeating the purpose of this machine working to stimulate and tighten them. Fascinating! Next you will be invited to lay down and relax, and you may experience a metallic taste in your mouth during the treatment but thankfully it’s completely pain free! Rhonda worked on one half of my face with the CACI machine, which I can only describe as looking like three giant metal Q-tip prongs! She works with firm pressure to draw the muscles upward and tighten around the mouth and jowls. After doing one side of my face only, she showed me the before and after in a mirror. Obviously as I have plump young skin and only subtle signs of aging I didn’t expect to see any dramatic results here, but I was surprised that it definitely made a noticable difference. 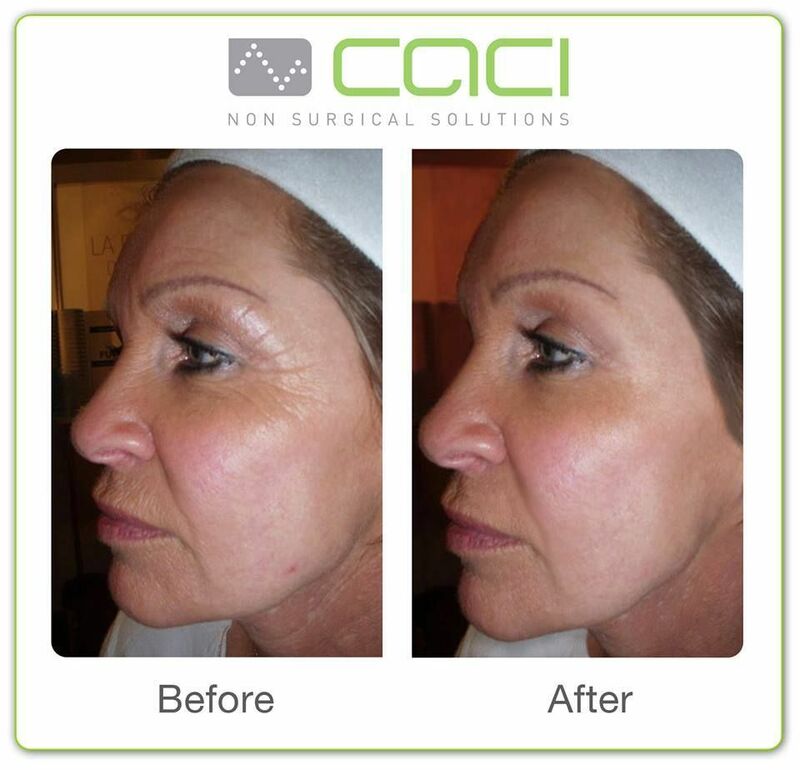 I wanted to suss it out to know if it was something I would recommend to my bridal tan clients as I had heard so many amazing reviews from London clinics offering CACI in the past. My opinion is if you are a bride under the age of 30, other facial treatments are the way to go as you won’t necessarily need this but could benefit more from clarifying and resurfacing treatments. But For brides over 30 or for mothers and grandmothers of the bride - this is absolutely the one for you! The lifting effect is dramatic and would be the best wedding prep I can advise! A course would be needed for full lasting effects, contact Rhonda and chat through your options! Her prices are also incredible when you compare to what some high end clinics charge in the city for the same treatment, so take advantage! Being an advocate of long term thinking and planning when it comes to skincare, I encourage you to invest in yourself. You only get one body and one face (Kardashians excluded it seems - I jest, I actually love them.) if it boosts your self esteem and makes you look and feel 10years younger for a special event or year round, why would you not? !